At first I thought, what, another far-off growing threat I have to extinguish? But Armies of Death is a bit different than the previous... however many it is I've had to do in the past couple of months! First of all, you get your own army this time around, which I thought was going to be awesome, but I never really got to use them. I might have rolled 7/17/7, but a series of lucky rolls meant my army spent pretty much their entire time hanging around just making me feel cool. I started by hiring a ship to make my way to Zengis, but only because it was called the Flying Toucan. Normally taking a boat in FF books is a fast-track to drowning, being attacked by pirates and getting lost, or all three, and especially so with over 200 men... but the Flying Toucan? I had to. Good choice too - as I hinted at before, my dice were stuck on rolling low, and we were soon in Zengis with barely an eyelid battered. If mercenaries bat eyelids. There was the small issue of being attacked by pirates (one out of three ain't bad), but they soon backed off when they saw I had over 200 men (I'm going to keep saying that, as it's not often you've got over 200 men at your command in a FF book). On arrival in Zengis, the book made my character wander around alone for some reason - this is where a modern computer-based RPG would detect I'd rolled seven for my skill, and let me take over 200 men with me as bodyguards (okay, I'm going to give up on the 'over 200 men' thing, as it's beginning to sound a bit fruity, and I don't think medieval mercenary armies were ready for gay commanders in chief, batting eyelids or not). I found a gold ring with the number 45 inscribed on it, and immediately knew it would come in handy - not because it's gold, or that a burly dude with an axe claimed it was his, but 'cause it had a number on it. Numbered rings were all the rage in 1988 Allansia. So this guy wanted it back, not that it would fit his fat fingers, each of which probably contained a higher skill rating than I, so I ran. My luck might have been down to about four by this stage, but still, I got away with it and ran into a bar where my luck continued, a bunch of 'vagabonds' telling me where to find the lead bad dude. Wandering on alone, cause obviously Zengis is safe, I wandered into a pet store and bought a creature that sounded suspiciously useful - a kangaroo that could sit on my shoulder and turn us invisible. Now, I've often read elsewhere how many of Ian Livingstone's books can be glorified item hunts, but come on... how specific a situation would require a magic kangaroo? For sake of suspension of disbelief and immersion, I'm kind of glad I didn't last long enough to find out. So onto that death - I'd just won a pie-eating contest, and survived an assassination attempt (perhaps it wasn't such a good idea to stand on the table after eating that much pie - if anything, the failed assassination attempt just stopped me from falling off the table and dying much more embarrassingly) when I came across some barrels outside, bound to contain an item I'd need 50 paragraphs later, no doubt. Instead I came across a leprechaun, who wouldn't bugger off, so I went to attack him. Now instead of being protected by the yeti tooth the captain of the Flying Toucan had given me earlier, as he said I would be, the leprechaun used his magic to glue me in place. I lost two luck points, placing me on one, I tested my luck and what do you know, you can't roll one or lower with two dice... and a sewer goblin came along and killed me. So um, I was enjoying Armies of Death, actually. It seemed to have a mix of things - sailing, barroom antics, wandering streets, an apparent distant army waiting to be vanquished... I wish I'd gotten further, but also fear I would've ended up frustrated I was missing a single item essential for progress, or something. I'd also have liked to have a mass battle at some point - even if the battle system was simplistic and random. Speaking of random, when the Flying Toucan came ashore, the captain coughed and took a while to recover. I really did think ooh, a foreshadowing of some kind of disease that will run through my army, decimating it and putting pressure on the need for more troops later on... but no. Weird. The book moved quick, sometimes a little too much so, but on the whole was better for it. But does anyone else think Ian Livingstone's face on the back cover is a deeper red than the back cover itself? come on... how specific a situation would require a magic kangaroo? One that occurs later in the book than you reached, and is unavoidable if you want a chance of winning. Naturally. I don't have my copy of the book to hand, but I remember one specific situation in which the tooth is useful. Does the section where you get the tooth give no hint of what it might protect you from? I wish I'd gotten further, but also fear I would've ended up frustrated I was missing a single item essential for progress, or something. This is one of the worst books for item-hunting. Particularly as two of the items you need don't have a number inscribed on them, but they do have price tags, which is a 'clue' that you need to make a note of how much you paid for them so you'll know the section to turn to when asked for the items in question. I'd also have liked to have a mass battle at some point - even if the battle system was simplistic and random. You'd have had more chance of getting into one if you'd gone by land (but then you'd have failed to acquire an essential item). There is one unavoidable mass battle (if you get that far), but only the one. I get the impression that the book wasn't thought through very well. 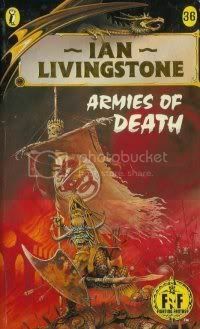 And this is one of my pet peeves about most Ian Livingstone books: the "item-hunting" nature of them are such that any reader familiar with his work will be tempted to open every door and pick fights with everyone in the hope that you acquire some random items that turn out essential later. The meeting with the Leprechaun is to be avoided if you wish to win (nothing protects you against it), but being a longtime reader of Mr Livingstone's you know you just have to pick a fight with it to make sure. It doesn't help that there are more red-herrings in this one than most other books. Like Ed mentioned there were two essential items with no numbers inscribed, but which you must remeber the price tag (without so much as a hint that you are supposed to when you buy them), but there are also at least 3 useless item with numbers inscribed, two of them misleadingly lying on a path where you must have missed the true path in order to find them. And that bit where you need information from other books to survive....it wouldn't stump any long-time FF fans, but yeah, first-time players are essentially screwed. It looks like it's there to make sure you read everyone of Ian Liingstone's books. The references to his other works have always been prevalent in his books, but this one certainly takes the cake. My goodness, ten years of Fighting Dantasy. Neat. I've been visiting the worlds of Orb, Magnamund, and Titan since 2014. It's been a fun journey. Well, Armies of Death wasn't one of the finder points. I finished it last week, and must admit that it was disappointing. Not awful, just... not awesome. It was a great start, that this time we're hunting demons the right way -- a rich warlord with an army! But the soldiers didn't DO a lot except count as a statistic, and the story largely consisted of a tedious scavenger hunt ("do you have a green vase AND remember how much you paid for it?"). It wasn't the worst, but it was disappointing in that being a wealthy warlord could have been quite the adventure... but wasn't.